Theoretical debates in the sociology of youth are often constructed around a tension between the reproduction of inequalities and social change. Discussions of social change have become touchstones for debates about contemporary youth subjectivities, as well as about the inequalities that shape all young people’s lives. In this context, the book ‘Youth and Generation: Change and Inequality in the Lives of Young People’ by Woodman and Wyn outlines and explores a sociology of generations as a means by which to grapple with the consequences of social change for differently positioned young people. Those approaching this book from within the discipline will be well versed in the Beck vs. Bourdieu / social change vs. inequality debates which have dominated the field in recent years. The authors argue that attempts to understand change should not be seen as somehow opposed to attempts to understand inequality, yet they often have been represented as such in youth studies. This book makes a strong intervention in this space, highlighting the ways in which these debates have often been mired in simplistic reductions. The book continues work begun in previous publications by the authors (Wyn and Woodman, 2006; Andres and Wyn, 2010), offering the concept of generations as a way theorising continuities and changes in the inequalities and opportunities available for young people. The book responds directly to critics (France and Roberts, 2015) of the generations concept by spelling out specifically how it can contribute to understanding inequality in late modernity. In the process, the book is at the forefront of key debates in youth studies surrounding the contemporary dynamics of inequality and subjectivity. This book is an important contribution to theoretical development in youth studies, and is instructive for how theoretical debates can be harnessed productively towards the development of new conceptual agendas suited to a complex empirical reality. At the risk of simplifying the debate, the main critique levelled at the generations approach is that it is too carried away with the significance of social change, and hence misses continuities in young people’s lives, particularly in relation to the contemporary significance of social class. The issue of social class is in this sense the fulcrum of these debates and formed the main impetus for a session at the recent Journal of Youth Studies conference dedicated to debating the various merits or pitfalls of the generations approach. The authors are aware of this and much of this book is dedicated to exploring what the concept of generations can contribute to understanding youth inequalities like those related to social class. However, this book goes beyond merely responding to critics, devoting the first half of the book to working through the theoretical issues that are at stake in studies of young people and social change. Theoretically, the book engages with the work of Beck and Mannheim to construct an approach to generations that is oriented towards capturing what the authors suggest have been important structural changes in the youth period that warrant the identification of a distinct generation. Set against a neoliberal context, the book foregrounds Beck’s discussion of insecurity and structural fragmentation as a defining feature of late modernity, and emphasises the ambivalent consequences of social changes for young people. In this sense, the book is a refreshing movement away from debates about whether or not there is too much ‘agency’ in the work of Beck, and rather uses some aspects of the individualisation thesis to raise productive new problems for youth studies to work through. On the structural side, this includes the consequences of precarity and structural heterogeneity, and on the personal side it includes the theme of ‘holding lives together’, or the fragmentation of biography and personal subjectivity in the context of structurally produced crisis. The argument for generation is made by placing the work of Mannheim in dialogue with Beck’s individualisation thesis in a way that relates to structural changes in the youth period. The authors argue that Mannheim’s concepts of social generation and of generational unit provide a means by which to assess macro level social change, as well as the consequences of social change for differently positioned individuals and social groups. In this way, the authors argue that the structural changes that Beck describes can be usefully approached as leading to a generational change that has reshaped the youth period, but which is experienced and negotiated differently by different generational units of young people. It is this interplay between macro level social change and the resources and identities of different generational units that drives the social generations approach as established in this book. This interplay remains a theme throughout the book’s second half, which explores what the authors consider to be fundamental issues in youth studies, concerning youth transitions, youth cultures, young people and time, and place. Chapters five and six apply the ‘generations’ framework to the two most dominant approaches in youth studies, those concerned with ‘transitions’ and ‘cultures’. These perspectives are generally understood as opposing traditions in the field. Both represent different ways of thinking about the dynamics of continuity and change. The ‘transitions’ approach is interested in mapping young people’s trajectories through education and the labour market; whilst the ‘cultures’ approach is broadly concerned with the dynamics of class and relationships between cultural practices, identity and social change. 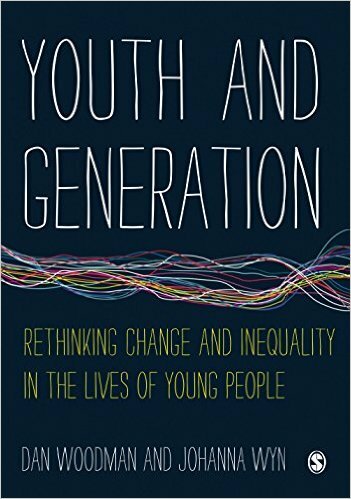 The authors suggest that using the concept of generations has the potential to reconcile the most important and useful insights from both traditions for use in youth studies; in seeing youth as a relationship rather than an age category and a more nuanced focus on inequalities in the context of change. In these chapters the authors argue that there has been a generational shift in the transitions and subcultures of young people. With regards to transitions, this is discussed in relation to the transition systems of late modernity, or the interlocking systems of institutions, social policies and structures that shape the relations of inequality that young people experience as they navigate their lives. The argument here is that the neoliberal emphasis on ‘flexibility’, and the widespread structural precarity that results, has reshaped both young people’s experiences and their expectations. One the structural side, this has made the capacity to navigate uncertainty one of the main factors in the structuring of the youth period. On the personal side, the authors describe how contemporary young people have become increasingly resigned to having to carve out lives within this precarity, even when they may desire the security that their parents were promised in an earlier modern era. What is distinctive here is the way that material inequalities related to social class are produced in new ways in precarious social conditions, and the qualitative shift in the subjectivities mobilised by young people in order to response to these changes. On the subcultures side, the authors argue that like debates about the relative merits of Bourdieu or Beck for understanding youth transitions, debates about subcultural / post-subcultural approaches have become organised around arguments for continuity or change in the structural basis for youth subcultures. They suggest that a generational framework, which views participation in youth cultural activities from a biographical perspective, can resolve the impasse thus created. Rather than a simple mapping of cultural activity onto class location, or a celebration of autonomous symbolic reflexivity, the authors argue that participation in youth subcultures reflects the biographical mobilisation of resources towards a complex symbolic world of available subcultures, none of which entirely capture a young person’s identity, and none of which are merely simplistic reproductions of class positions. Through empirical examples and a strong theoretical framework, the book engages with the crucial question – how do processes of social change and inequalities play out through each other? This is a difficult question youth studies must continue to address in order understand the dynamics and possibilities available for young people in the vastly complex conditions of modern life. Overall, the book offers both a broad level and nuanced analysis of the contemporary conditions in which youth must shape their lives. The main concept they mobilize to further their analysis, ‘generations’, is developed in a way which is sensitive to context, location and time period. The approach furthered here is intended to be of use for youth scholars in a range of different contexts and locales; not limited to the conditions of the ‘global North’. Their analysis is particularly strong through their demonstration of the concepts of individualization and generations as broad frameworks capable of highlighting the macro-level social changes whilst also affording micro-analysis to the specific dynamics and complexities of young people’s lives. Whilst the book does not offer a ‘class analysis’ in its orthodox sense, one convincing implication of the argument in this book is that debates about whether and how much class determines young people’s lives are missing the complex empirical reality that youth studies must now confront. It is not simply whether, or how much, young people’s lives are shaped by structural inequalities that is at issue in this book. Rather, the concept of generations suggests a means by which to capture the social dynamics through which inequalities are expressed and reproduced on the level of young people’s biographies and subjectivities, as well as the way in which these dynamics reflect the specific historical conditions that young people confront. This is not to say that generational change is necessarily happening everywhere all of the time, but that social changes connected to individualisation and the consequences of neoliberalism make a social generations approach useful for understanding the position of young people in the structural and personal landscape of late modernity. In this, Youth and Generation: Change and Inequality in the Lives of Young People offers an innovative, engaging and theoretically rigorous account of the dynamics of inequality and change shaping young lives, and is essential reading for those researching, theorising or working with young people. This entry was posted in Uncategorized and tagged Dan Woodman, generations, individualization, inequality, Johanna Wyn, social change, social theory, transitions, youth cultures, youth sociology. Bookmark the permalink.